There are times when you can get by with a less expensive wine and then there are times you want to drink the best. During this long Fourth of July week I have been drinking some of my favorite wines, some of which certainly are special occasion wines. 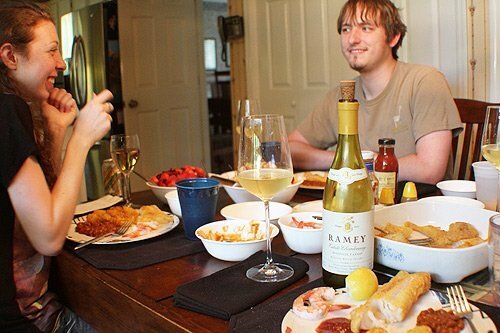 A Ramey chardonnay is hard to beat for any occasion, but especially when you are celebrating something or having a special dinner. David Ramey, one of California’s great pioneering winemakers, has about a dozen chardonnays available at any particular time. Each is distinctive, and each is worth the price. 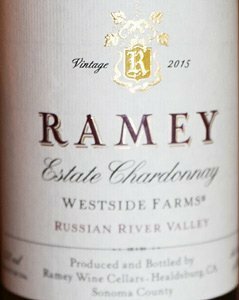 The single-vineyard Westside Farms chardonnay from the Russian River Valley may be at the upper end of Ramey’s chardonnay price range, but it is one incredible wine. It has everything you could possibly want in a fine white wine. It is a gorgeous pale gold in the glass with inviting aromas of lemon, spices and flowers. The wine is incredibly complex, with layer after layer unfolding with each sip. One time I got butterscotch, another lemon, and another apple. It’s all wrapped in juicy fresh acidity. This is not a wimpy wine, but the mouthfeel is delicate and velvety, with a long finish. This wine should be good for at least another five years, if you can find any. They only made 234 cases. After harvest the grapes are whole-cluster pressed for phenolic delicacy. Native-yeast and full native malolactic fermentations take place in barrel, with sur lies bâtonnage. After aging 18 months in 20 percent new French oak barrels, this chardonnay was lightly fined and settled in tank before being bottled without filtration. Westside Farms, a 75-acre ranch on Westside Road, has been in use as farmland since the middle 1800s. If you can’t find this particular Ramey chardonnay, pick up whichever one you can find. 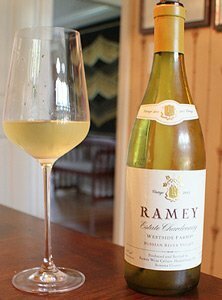 I have never tasted a Ramey chard that I didn’t love. Winery: David Ramey has a long and celebrated history in the California wine industry. After getting a graduate degree from UC-Davis he worked at the famed Chateau Petrus in Bordeaux and learned the Old World winemaking methods. He brought that knowledge back to California and applied it to California’s grapes. Before founding Ramey Wine Cellars in 1996, David Ramey helped establish Simi Winery, Matanzas Creek, Chalk Hill, Dominus Estate and Rudd Estate. While at Dominus, David’s boss allowed him to “make a little chardonnay on the side.” That was the beginning for David and Carla Ramey. The first harvest resulted in 260 cases. David moved to Rudd in 1998, and his own brand continued to grow, with distribution in six states and Great Britain. Russian River and Carneros chardonnays were added, and 2001 brought a cabernet sauvignon, Ramey’s first red wine. In 2002 he left Rudd to become a full time independent producer. The winery continued to grow, adding new wines and employees. Cabernet sauvignon, chardonnay and syrah are their primary varietals, but they also produce outstanding pinot noir. The company says it is dedicated to creating high quality, handcrafted wines with balance and richness from the area’s finest vineyards. They say they marry Old World methods with New World innovations. They have a tasting room in Healdsburg, open by appointment. David never stops trying new things. He and his wife started a second label, Sidebar Cellars, in 2014. This allows Ramey to explore new and diverse varietals and unconventional blends. He also is having fun trying new things without detracting from the main show. Goes with: We drank this wonderful wine with fried cod. Fresh Market had some beautiful cod filets so I picked up three for four of us. Teri and I love cod, as does my son Michael, but his girlfriend doesn’t care for fish, so each of us had a whole fish to ourselves. That turned out to be too much, but it was just as tasty warmed up the next day. We love leftovers at our house. I used some packaged Cajun style breading from Louisiana Fish Fry Products, and it added a nice zip to the meal. After breading the fish, I fried them in a pan with about half an inch of peanut oil at medium high heat. I fried them for about 2-3 minutes per side and they came out crunchy on the outside and soft and flaky inside. We had some cocktail shrimp for an appetizer and added baked beans left over from a weekend brunch and Yukon Gold tater tots that I found frozen at Sprouts. We also had some fruit salad and tossed salad. It was a spectacular meal, and paired with this wine, gave us another reason to celebrate being Americans.